It is officially April. This is one of my favorite times of year as it means summer is right around the corner. The days are getting longer, sun rising from its slumber earlier, and the air continually gets warmer. For me this means that training, while it won't get easier as my intensity will ramp up, but the motivation tends to be easier to find. By entering into April that puts me right in race month, and 3 weeks away from my first race of the season. With one more week of high mileage before scaling back a little to preserve my legs I got to thinking about this years training compared to last year. While the training never really ends for me as it has become ingrained in my soul and a way of life for me the actual race specific training started this year in the second week of February. Since then I have logged a total of 401 miles (that does not include January in which I was running, lifting, and spinning just not tracking my mileage for training) which is probably the most mileage I have ever put in. Listening to my body: Training this time around has been a little different for me with the most important aspect being that I have been listening to my body more. I've learned how to know when it is time to take a break or when I need to break away from my diet of a day. Previously I would push through no matter what and usually that resulted in me getting sick or so run down that I didn't perform. I used to be afraid, or feel guilty, when I would be forced into taking a break thinking that it meant I wasn't going to succeed. This time around I am listening to my body, if I wake up in the morning and feel so beat up I can't get out of bed I don't, or if I start a 10 mile run but only have the energy to go 8 I only go 8. Yes, there are still do force myself to push that limit because getting out of your comfort zone is how you grow, but all in all if my body is telling me its time to stop I do. Tracking my training: Tracking my training is something I have never been good at. Every year I buy a new journal, so I am going to record each day of training. And each year I do so for a couple weeks at a time and then I forget about it for a month or so. Don't get me wrong I love this idea of it and I especially love the journal I bought this year, The Believe Journal by Lauren Fleshman and Roisin McGettigan-Dumas, in fact I absolutely love everything about it yet have a hard time remembering to write in it. I've tried leaving it on the table so that I remember every night, but that drives my amazing fiance crazy resulting in every time I go to look for it, its put away somewhere else. Thank goodness for technology which has allowed me to track my running through my phone thanks to the wonderful app known as Strava. Through the Strava app, paired with my Garmin forerunner watch, I am able to set myself a mileage goal every week, and see my progress towards hitting that goal. It keeps track of all the splits per mile, as well as the elevation gained or lost during that mile. So I while I do still have a goal to write in my journal, its now strategically place out of the way but visible, I am thankful for the app as it has really helped me track my mileage and splits through this years training. Strength: While I was never adverse to strength training prior to two years ago I never did a lot of it. It wasn't a big part of our program at the Gonzaga and looking back I wish it had been more stressed. Since I have started incorporating strength training 5 days a week into my training schedule my running has improved by leaps and bounds. The power that I have obtained from lifting has helped me to lower my splits for just an everyday run, and the strength has helped to increase my muscular endurance capabilities. While the benefits of strength training has been an important part of what I have learned what I believe to be the most important thing I have learned throughout my training journey is the strength inside. The strength that comes from learning to believe in yourself. Believing in myself was always something I struggled with. It wasn't that I believed I was worthless just never fully believed I could live up to what others thought I could be, which led to me feeling as though I was always disappointing people. This was not a successful way for me to live and what I feel was my biggest hurdle to overcome. Throughout my training and racing the past two years I have found that in order to succeed I have to trust myself. I have to trust that the person that was and have become is strong enough to push. Pushing the limit of what your body can handle required me to take a step back and look at who I wanted to be and dig deep to find the strength to believe in myself. 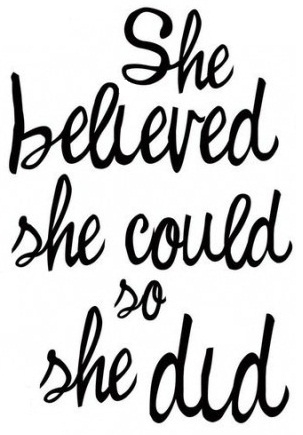 Once I started believing that I could do it, and would do it then each day became stronger and fuller. The journey has been a fun one so far, and I am blessed to have an amazing support team that allows me to take this journey, but the best part is what I have learned about fitness, nutrition, and most importantly myself. Is there something important that you have learned because of a journey that you have taken? What is your favorite way to get your fitness in?